SoftColor PhotoEQ gives you the power to perform image-editing on a single file, or multiple image files and folders in batch. With SoftColor PhotoEQ, you'll be able to conduct color correction, image editing, and color management tasks faster and easier than ever before, using innovative drag-and-drop methods that make working with your images an intuitive process. The brains behind SoftColor PhotoEQ have already done a lot of work thinking about what makes a good photo into a great one. 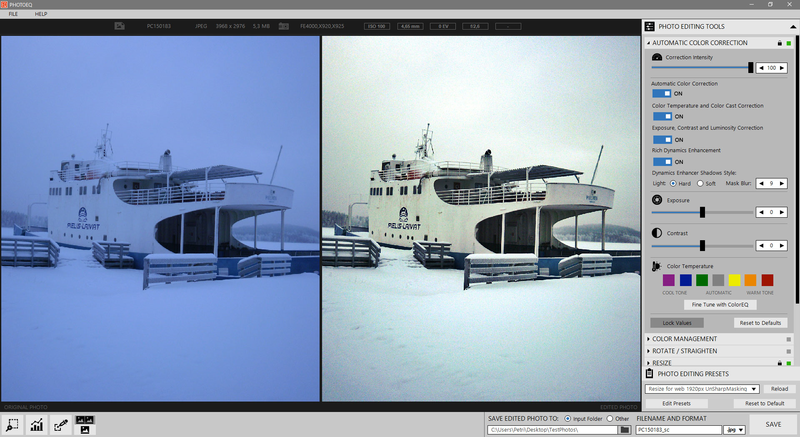 Just use the automatic color correction to fix white balance, exposure, and contrast in just a single step. Or convert and render between different color spaces, transforming RGB to CMYK, for example. When you're done, save your work as JPEG, TIFF, PNG, BMP, or PSD files for the ultimate flexibility. All of your editing tools are here for you in SoftColor PhotoEQ! Resizing, cropping, rotating, straightening, sharpening, and red-eye removal make easy work of editing tasks, while the non-destructive nature of the program means you're never too far from correcting a mistake. And if you've got a boatload of photos to edit, just use the batch processing functionality to let the computer do all of the work for you! After you purchase SoftColor PhotoEQ it may be used indefinitely. SoftColor PhotoEQ is licensed per computer, and not per user. Each license allows installation on 3 computers, and SoftColor PhotoEQ may be used at exactly the same time on each of them. Upgrades to future versions of the software will be free for minor versions only. For versions after that, upgrades will require additional payment, which will be discounted by 50%. It will be discounted only if you've purchased the last major version. geo User Just a question for the developer: Does this offer provide anything more when it comes to photo optimization over the 'SoftColor Automata PRO' product ? Just wondering since I do have the PRO version and very happy with it. 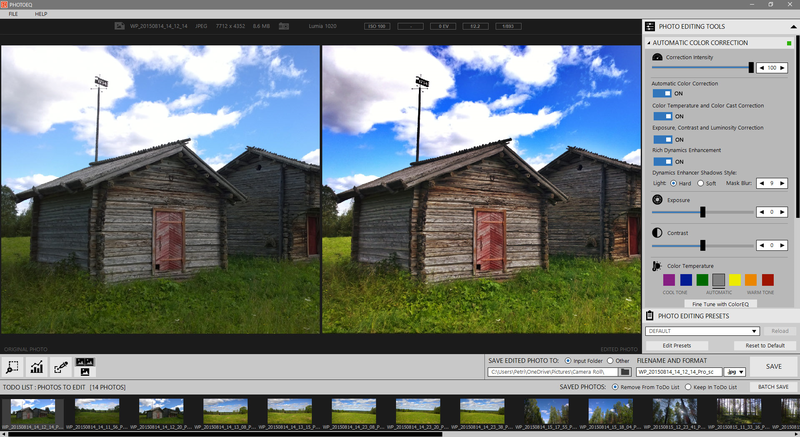 Petri Piirainen geo User, Main difference is that Automata Pro is hot folder based photo editing workflow application. Automata watches a folder or folders for incoming files, then applies color correction, image editing and color management processing for photos In Automata you can create multiple batch processing workflows which operate simultaneously. Also it is possible to use 3rd party scripts and command line tools with Automata's workflows. In PhotoEQ batch processing is for images which are loaded to todo queue. 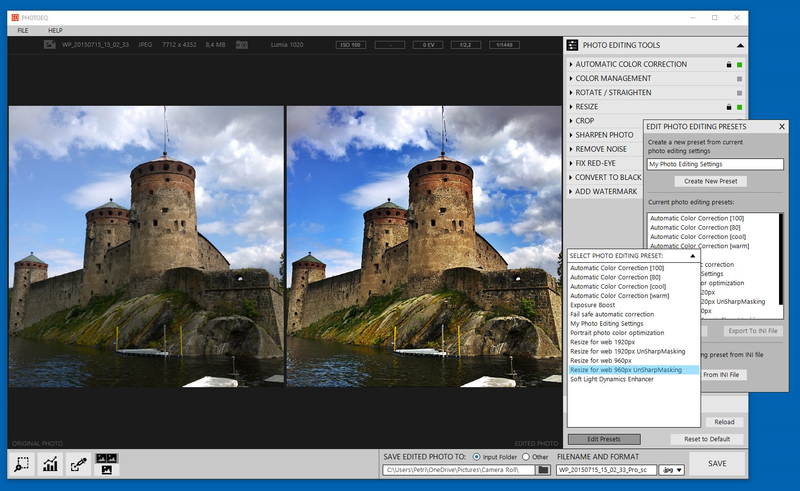 PhotoEQ and Automata have same imageprocessing engine. Constantin Florea @Christopher User, I just resent you the receipt email.